I’m trying something a bit different with this post, taking inspiration from that Twitter discussion of The Rings of Saturn in the summer. I tweeted my thoughts on The Girls of Slender Means as I was reading it, and am now collecting them together here. I’ve called this “reading out loud” because it’s more off the cuff and impressionistic than a proper review would be. I felt that a ‘known’ book like this could support that kind of post. 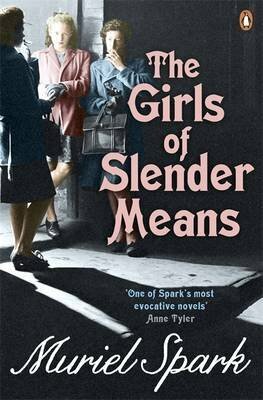 To introduce the book briefly: The Girls of Slender Means was first published in 1963. It’s mostly set in 1945, and concerns the May of Teck Club, a London hostel for women aged under 30. I’ve expanded the original tweets a little for clarity, but still I doubt the post below will make much sense if you haven’t read the novel. If you’re looking for a recommendation, though… consider the book recommended! It’s been too long since I last read Muriel Spark. I’m enjoying it from the first sentence: “Long ago in 1945 all the nice people in England were poor, allowing for exceptions.” Instantly recognisable voice: reading it feels like coming home. Already the narrative is being subtly destabilised (which I’m coming to expect from Spark). The present-day passages feel more like intrusions than an alternative plot strand. Interesting that present-day passages (which discuss a character’s death) are all telephone conversations. I need to read further to understand what this means, but I’m thinking it’s perhaps a comment on the distance created by that form of communication. I love the little details that punctuate a scene with humour, such as the arguments over brown wallpaper in the drawing-room, or the frequent soundtrack of lines from Joanna’s elocution lessons. Just twigged that there’s a theme of missed (or misunderstood) communication: the present-day phone calls that break up, the rote learning of elocution lessons (lines that are repeated but not necessarily felt by the person saying them). A bomb explodes in the club’s garden towards the end of the book. Interesting that this is explicitly framed as disrupting the girls’ sense of time and space. Time is experienced differently by those trapped inside the club, and those outside who realise how urgent the situation is. Besides bringing the plot to a point of singularity, the fire seems to bring individual characterisation to a head. I noticed this especially with Joanna reciting her elocution lines – which manage to be both empty and all too meaningful. The closing scene of murder and violence amidst the WW2 victory celebrations underlines themes of darkness beneath events and distance from authority that have run through the book. I love that the final paragraph manages simultaneously to link back to the start of the novel, push forward into the future, *and* leave the present both open and closed off. The Girls of Slender Means (1963) by Muriel Spark, Penguin Books (2013 edn), 144 pages, paperback (source: personal copy).